Bangkok is not an ‘ancient’ city per se – as compared to some of Thailand’s heritage capitals – but there is something about Bangkok that still holds on to its old world charms. For those passionate about discovering local culture and stories, this is the city to do it. And for photographers – amateur, professional and Instagrammers alike, Bangkok is a dream. Here are 5 ways to get to see ‘old Bangkok’ that’ll still peak contemporary interests. Bangkok’s riverside is where its more historic roots lie; stories of colonialism, intrigue and charm. A walk around the area will uncover those tales, and there are plenty of guided walking tours too. It is one of the most fascinating and areas of Bangkok, great to people watch and see how the river today still holds great importance to the people of the city as it has done for centuries. But it’s not all old-world, this is Bangkok’s new “Creative District” with modern warehouses featuring independent retail and art galleries. And the galleries are not just confined to indoors, this area also boasts Bangkok’s biggest collection of contemporary street art. A compound of royal residences in Bangkok, Thailand, Dusit Palace Area is constructed over a large area north of Rattanakosin Island. Originally called Wang Suan Dusit or Dusit Garden Palace eventually became the primary place of residence of the King of Thailand. Visit the Ananta Samakhom Throne Hall former reception hall within Dusit Palace in Bangkok, Thailand. It now serves as a museum and is from time to time employed for certain state occasions. 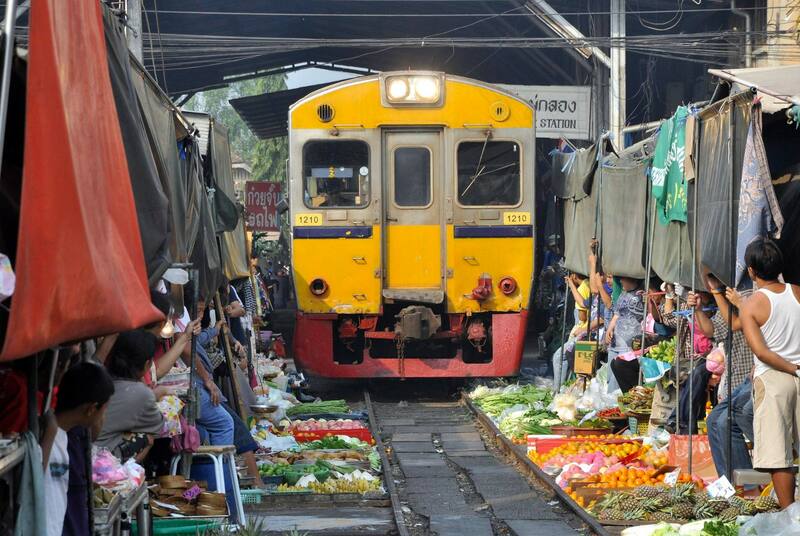 This old market has to be seen to be believed, built on an important railway line with vendors doing their trade on the live train line itself. And a few times a day, trains will pass through sending the vendors into a frenzy to pull back their wares to the side of the line. It is over an hour’s drive out of the city, more if there’s traffic and the trains pass at set times a day, so a bit of planning is needed if you want to visit, but it’s well worth it for that iconic Insta-story. The Jim Thompson House is the home of James H.W. Thompson, a self-made American entrepreneur who was the founder of the world renowned Jim Thompson Thai Silk Company. Thompson’s achievements during his 25 year stay in the Kingdom of Thailand have won him much fame as the “Legendary American of Thailand”. The Jim Thompson House is located on Soi Kasemsan (2) Song, opposite the National Stadium on Rama I Rd. But the tea is, he could well have been a CIA spy. And then one day, while walking the jungles of Malaysia he disappeared off the face of the earth.